18-Oct-2002 -- I, Joseph Kerski, Geographer at the US Geological Survey, and Pennsylvania Geography Educator Mary Braccili, took a brief tour of 40 degrees north, 75 degrees west during the 2002 Annual conference of the National Council for Geographic Education (NCGE). The members of the NCGE meet annually to share ideas about teaching geography, this year in downtown Philadelphia, Pennsylvania USA. As the conference brought together over 500 geography teachers from across North America and elsewhere, and as one of the workshops I gave at the conference was about integrating topographic maps and GPS into the K-12 and university curriculum, it seemed only fitting to make a confluence pilgrimage my last activity for the conference before heading home to Colorado. On a beautiful October morning, we drove north from the conference site near Philadelphia's City Hall, and crossed the Betsy Ross Bridge east into New Jersey. After driving down some quiet streets lined with beautiful trees and homes, we parked near the maintenance shop at the Riverton Country Club at the boundary of the communities of Riverton and Cinnaminson at approximately 10:30 am local time. Riverton was established as a Quaker village on the Delaware River in 1851 as a summer retreat for Philadelphia businesspeople and their families. They decided that the community should have a golf club, and the course was opened during the summer of 1900. After crossing one fairway during our walk to the south, we walked along the left path of another fairway before discovering the location of the confluence. The confluence lies on the left side of the fourth fairway of the golf course, less than two meters from the rough, and approximately 35 meters southeast of the fourth hole and pin. A deciduous tree is approximately 7 meters to the west of the spot. I hope that these autumn photographs and movie provide an interesting supplement to the excellent late winter photographs provided by Charles Hayden. The vegetation covering the confluence is bluegrass, approximately 2 cm high. The terrain that the golf course occupies is quite flat, this being the Delaware River Valley between Pennsylvania and New Jersey. The country club is located in Riverton, a wooded, largely commuter suburb for Trenton, New Jersey, and metropolitan Philadelphia, Pennsylvania. Several tree species growing along the sides of the fairway and the bright, warm morning made this an altogether pleasant experience. Doug Davis, greenkeeper for the Riverton Country Club, drove up in a golf cart, along with the country club dog, and asked us what we were doing. He thought initially that we might have been from the New Jersey Department of Environmental Quality, as our clothes and back-and-forth walking actions obviously were incongruous with the others on the golf course that morning. Doug was extremely amiable, and concerned that Ms Braccili's car might be struck by a right-slicing golf ball. While they left to move the vehicle, I took several photographs, pausing to allow golfers to pass. When they returned, we chatted with Doug, who already was quite familiar with GPS. He knew of GPS applications in playing on and maintaining golf courses, and even was familiar with the fact that a latitude-longitude confluence existed on his very own course. He was interested to realize that this was even more of a special location than other confluences, in that it is a 5-degree longitude and a 10-degree latitude confluence. On the walk out, we met two golfers who mistook us for the news media, as we were dressed up for the conference. After explaining our story to these friendly folks, and spreading a bit more geographic enlightenment and good tidings, we trekked back to downtown Philadelphia for the remainder of the geography education conference. #1: Confluence site (at spot where GPS receiver sits) and part of the fourth fairway at Riverton Country Club, looking southeast. 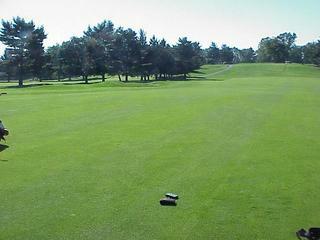 #2: View from the confluence to the south-southeast down the fourth fairway. #3: View from the confluence to the west. #4: View from the confluence to the north, toward the green of the fourth fairway. #5: Geography educators Joseph Kerski and Mary Braccili holding GPS receiver and sign at the confluence. #6: GPS receiver indicating coordinates and time of confluence visit. #7: Doug Davis, Riverton Country Club greenkeeper, and golf course dog, in a view looking to the east from the confluence. #8: 360-degree panorama from confluence site (.mpg format--616 KB).